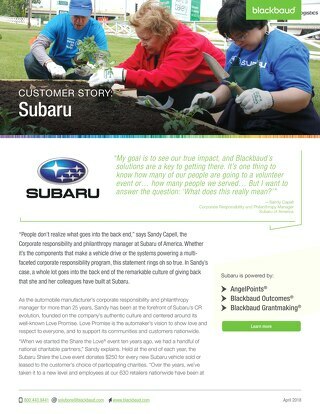 A strong corporate social responsibility (CSR) program is becoming the industry standard for leading companies today. Whether you're running an employee volunteer program, a workplace employee giving program, a grants program or all of the above, there's a great deal at stake! 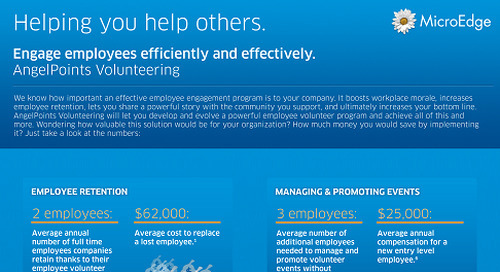 Learn why it's so important, and what's actually at stake with a robust CSR program. What Happens to Impact Stories When Corporations Align with the SDGs? Your CSR practices can influence consumer behavior, investor relations, and employee engagement. Find out how. Are you giving CSR the attention it deserves? 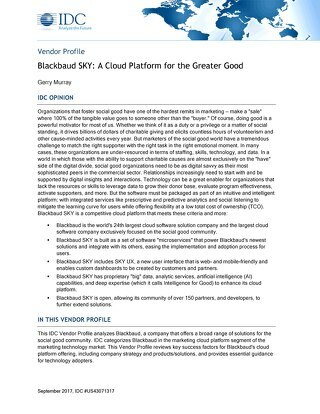 Find out why IDC, a premier provider of market intelligence for IT, has picked Blackbaud SKY as a competitive cloud platform that can help your company excel in the social good community. As we see a shift in corporate giving and engagement, we turn to the advice and experience of Blackbaud CSR expert Rachel Hutchisson to learn more. 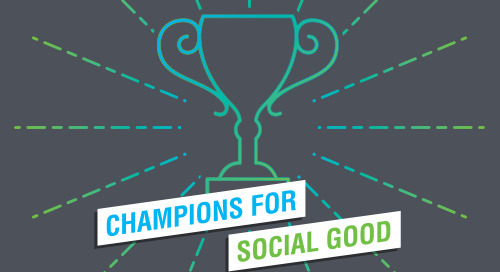 In this episode of the Champions for Social Good Podcast, Steve reviews the dramatic increase in the use of data in recent years and how it has transformed social good. Rachel discusses how her mantra "good is for everyone" relates to all companies, from small businesses to multinational corporations, and talks about the challenges faced by company's of all sizes. 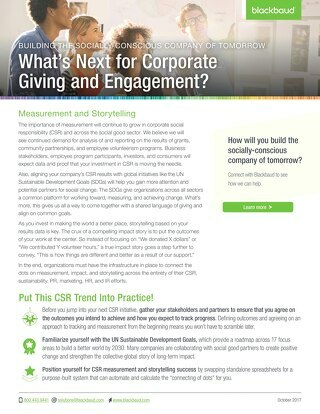 The importance of measurement will continue to grow in CSR and across the social good sector. Read on to learn more about impact and storytelling. 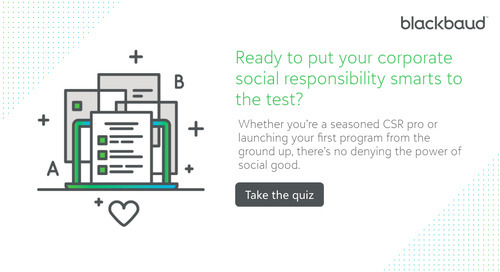 Learn how you can incorporate human social responsibility in your CSR programs. Thanks to the growing link between employee recruitment, engagement and retention efforts and the private sector’s deepening commitment to social good, we see the role of HR expanding. 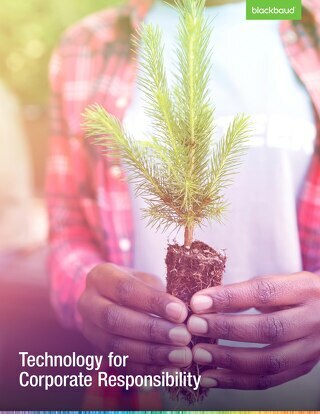 Many corporate giving programs demonstrate an understanding of the link between global sustainability and the notion that investing in CSR and sustainability can have a positive impact on business. In this episode of the Champions for Social Good Podcast, Jamie Serino speaks with Chris Jarvis and Angela Parker, Co-Founders of Realized Worth. Read more to learn about taking a holistic approach in furthering your mission in this world of corporate giving and employee engagement. 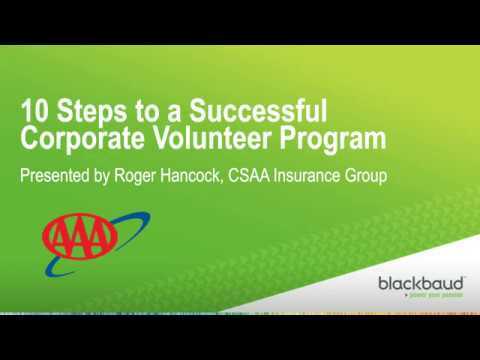 In this episode of the Champions for Social Good Podcast, Jamie Serino speaks with Roger Hancock, Manager of Community Affairs for CSAA about the 10 steps to building a corporate volunteer program.